Characteristics: Cedrus deodara is a popular evergreen with a pyramidal shape and horizontally arranged branches that droop gracefully at the tips (1,2,3,4,5). 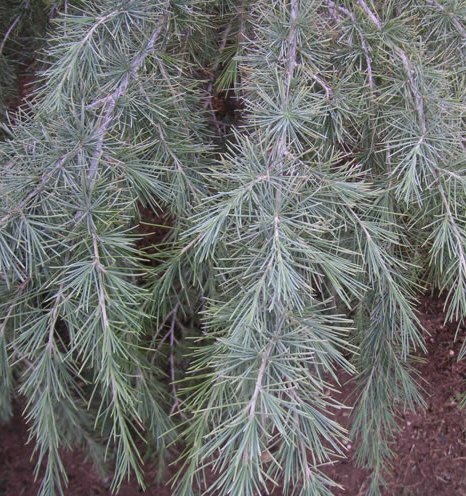 Its stiff, evergreen needles, which measure about 1-2 inches in length and are arranged in clusters of about 30, are typically dark green with a silvery flush that makes them bluish-green in color (2,4,5,6,8,9). Its needles, which may be held for 3-6 years, often fall in late spring as they are replaced by new growth (4,8). Trees are monoecious, with male and female cones forming separately on the same plant (7,10,11 ). Male cones, commonly called catkins, begin forming in the summer as solitary upright buds on lower branches and measure 2-3 inches in length (1,7,12). These emit large amounts of pollen in the fall (1,5,8,13,14). The barrel-shaped female cones, which measure 3-5 inches at maturity, appear upright and singly at the tips of short upper branches in August and are initially pale green and inconspicuous (1,8,12,13). The female cones are wind pollinated and, once fertilized, overwinter and begin expanding in the spring and summer and ripen in the fall, becoming brown, woody, and resinous as they mature (7,8,10,12,13,14). Each ovuliferous scale on the cones contains two triangular, winged seeds (1,12). Once mature (up to 13 months after fertilization), the female cones break up and release the seed (2,13,15). Seeds overwinter in the ground and germinate under favorable conditions in March or April (15). Seeds are light brown, with large wings, and measure ¾ inch long by ¼ wide (2). It may take up to 45 years for a tree to produce seeds at a commercial level, and about one year in every three is a good seed year (1,12). Cedrus deodara commonly grows to 50 feet or more in height but can grow as tall as 200 feet in its natural habitat (3,5,6,9,14). The tree’s trunk usually remains straight and can measure more than three meters in diameter at maturity (2,16). When young, the tree will have pyramidal shape. With age, however, it may lose its leading shoot and extend out its upper branches, becoming flatter and wider at the top and developing a more cylindrical shape (3,8,9,18). Its bark is initially smooth and greyish brown, sometimes almost black, and becomes fissured and scaly with age (5,6,7,11,12). The bark and leaves are fragrant (11). Natural History: Cedrus deodara grows in a variety of habitats, but its native range is in the high mountains of the Himalayas, where it is found from 3,500 to 12,000 feet in elevation (2,3,5,6,8,17). It typically forms part of temperate forests with other coniferous and broadleaf tree species (2,17). It is a very important tree for timber in Afghanistan, Pakistan, India, and Nepal (17). In many areas of its native range, deodar cedar is less common today due to over-logging (15,17). It was brought to England in 1822 as an ornamental tree (13,17). Within a few decades, it was being cultivated with the hope that it would become a viable commercial tree; this idea, however, was abandoned because the British climate did not allow the tree to grow as large as it does in its native habitat (13). It was brought in the early 1830s to the United States, where it continues to be a popular landscape tree (18). It is very common in Southern California, where the climate is well suited for growing the tree (18). There are a variety of cultivars available in trade today (17): ‘Kashmir’ has silvery blue-green foliage and is hardy down to -22 °F (1,9,16); ‘Argentea’ has silvery bluish-grey foliage and is a fast grower (5); Aurea’ has yellow needles and grows to about 30 feet (5,9,16); ‘Pendula’ (or ‘Prostrata’) has long drooping branches and grows up to about 10 feet (5,9,16); ‘Robusta’ has stiffer twigs (16); Shalimar’ has blue-green foliage and is the most hardy cultivar used in the United States (1,5,9); ‘Pygmy’ is a dwarf variety with blue-green foliage and grows in a mound (5).Other cultivars include ‘Glacier,’ ‘Glacier Blue,’ ‘Gold Cone,’ Himalayan,’ ‘Jim,’ and ‘Snowsprite’ (19). Cedrus deodara is one of the four “true” cedar species, which belong to the genus Cedrus—a name derived from the Greek κέδρος (kédros), meaning “cedar” (1,20). It is not related to the trees called cedars that grow natively in the western United States (1,14). True cedars grow natively in the Old World and include the Cedrus libani, the biblical cedar of Lebanon (1,18). The specific epithet deodara comes from the Sanskrit devdar (or devadara or devadaru), meaning “timber of the gods” (6,13,18). It is the national tree of Pakistan (13). It can live up to 1,000 years old (14,21). Cultivation Notes: Cedrus deodara is a very popular landscaping tree in the United States and Europe (2,5,12). It is generally propagated from seeds but can also be grafted to get a desired cultivar (1,5,9). Cuttings can also be successful with some cultivars (1). No pretreatment is necessary for seeds to germinate, although a period of stratification can improve germination rates (1). Seeds can be started easily by planting them into small pots with good soil (15). In cooler areas, seeds can be germinated in full sun; in hotter areas, some shade will keep germinating seeds and new seedlings from drying out (1,15). In most places, it will probably be beneficial to keep small plants in protected areas for about two years (15,18). Purchased container-grown specimens can be readily transplanted, but should be also protected from cold winds (9,16). The tree typically grows slowly for the first three or four years (18). Its rate of growth increases as the tree grows older and under optimum conditions, a mature tree can grow at the rate 2-3 feet a year (4,5,11,18). The plant prefers full sun and will not do well in full shade (1,4,5,6,10,11,12,15,16,19,20). Deodar cedar is the least hardy of the true cedars and frost-damaged trees will die back at the top (9,10,16). Young trees are most vulnerable to injury from frost and cold winds (1). It is very drought tolerant when mature (5,11,12,16,20). It is tolerant of a variety of soils, including loamy, sandy, or clayey, as long as they are well drained (1,4,6,8,9,10,11,12,15,16,20). It does best in deep, moist, acidic soils, but will do well in slightly alkaline soil conditions as well (1,6,10,11,16). Deep waterings and well-drained soil will foster fast and robust growth (18). The tree should not be planted on a steep incline as this will inhibit water from reaching the deep roots (18). If tall and slender growth is desired, several trees can be closely spaced (5-8 feet apart); this will increase competition among roots for nutrients and among the canopies for light, keeping the branches from extending out to their full length (18). The tree needs little pruning to develop good form and strong structure (16). If possible, lower branches should be left on the tree to show off the tree’s true form and they will gracefully sweep the ground, reaching up to 20 feet long (3,16). Because of its large size, it should be grown where there is enough space to accommodate it (11). Cedrus deodara can be used in the landscape a variety of ways. It is very popular as a large specimen tree (5,9). It can be grown in lawns or used in buffer strips around parking lots or in median strips on roads and highways (16). It can be used as a windscreen or pruned or sheared as a hedge or shrub (3,4,5,20). It can also be grown as a bonsai or espaliered (10,11). It is a good substitute for white pine in landscape plantings. (19). There are no serious diseases or pests that affect the long-term health of the deodar cedar: it is resistant to verticillium, but can be sensitive to beetle borers, deodar weevils, phytophthora, root rot, and sooty mold (1,3,11,16). It is tolerant of a variety of environmental conditions, but can be sensitive to severe atmospheric pollution (6,10,12). Dropped litter may be a nuisance in the form of cones and needles (11). Dropped needles, however, can be used for mulch around new seedlings (18). Ethnobotany: Cedrus deodara has been used by people in a variety of ways. It is an important source of lumber (2,13,20). Its heartwood is durable, strong for its weight, and rot and insect resistant (13,15,17). It has a characteristic fragrance and a rich, oily feel (12). It has straight, fine grain and takes high polish (12,21). The wood is commonly used for construction and carpentry (12,17,21). It is used to make railroad ties and bridges (12,13). It produces good plywood and is also used to make pencils (12,22). Cedrus deodara is believed to be the tree of God and is often used in the construction of temples and palaces or is planted in groves near temples for religious reasons (6,13,15,21,23). Hindu legends refer to the tree, indicating its religious and cultural importance (13). The wood is used for incense and female oracles of the Hindu Kush used the smoke of burning wood for inspiration (21). In ancient Egypt the wood was used to make sarcophagi for mummies (6). The wood (often in powder form), resin, and bark exhibit numerous medicinal uses, including anti-inflammatory, antioxidant, and anti-cancer properties (15,21). The heartwood has anti-flatulent, expectorant, diaphoretic and diuretic properties (10). A decoction of the wood has been used to treat a variety of ailments, including fever, pulmonary and urinary disorders, rheumatism, hemorrhoids, insomnia, and diabetes (10). It has also been used as an antidote for snakebites (10). Resin from the wood has been used externally to treat skin conditions, bruises, and joint injuries (10). The essential oil distilled from wood chips and sawdust is used as an antiseptic and as a remedy for tuberculosis, bronchitis, catarrh, acne and other skin conditions, arthritis, and as a diuretic (5,10,12,24). The oil is often used for aromatherapy and is said to have calming properties and to promote restful sleep (24). The oil’s vapors open sinuses and breathing passages when rubbed on the chest; it also soothes coughs, fights viruses, and alleviates ear congestion (24).The oil is also used to scent soaps (1). The oil repels insects and has been used as an application to the hooves of horses and cattle and to the feet of camels to prevent bites of the Himalayan “potu” or “pipsa” fly (4,21,24). In India, the essential oil from the wood has been used as insecticide and herbal remedies for animal diseases (12). The oil also has been shown to have antifungal properties that may have potential in controlling fungal deterioration of spices during storage (22). The pesticide Pestoban is a concentrate containing, in part, oil extracts from Cedrus deodara (12). The oil is also used to produce a powerful molluscicide (12). The bark is astringent and used to treat fevers, diarrhea, and dysentery (10,21). The needles are used to treat tuberculosis (10). Oil from the seeds is used to treat skin conditions (10). Because is it so long-lived, tree rings from Cedrus deodara are useful in obtaining long dendrochronological records that contain useful climatic information (2). The tree serves to control erosion and conserve soil and is used as a revegetation species (12). Deodar cedars provide habitat, cover, and food for birds and other wildlife (4,11). It can be used as a Christmas tree and specimens used as street trees are often decorated at Christmastime, especially in Southern California (4,12,18,21). “Christmas Tree Lane” (Santa Rosa Avenue) in Altadena, California, for example, is the longest-running large-scale Christmas light display in the country where 134 deodar cedar trees have been decorated every December since 1920 (25). 1. Pijut, P. “Cedrus – The True Cedars.” Journal of Arboriculture 26(4): July 2000. 2. “Cedrus deodara.” The Gymnosperm Database. Accessed March 16, 2016. 3. “Cedrus deodara.” Missouri Botanical Garden. Accessed March 16, 2016. 4. “Deodar Cedar: Cedrus deodara.” Arbor Day Foundation. Accessed March 16, 2016. 5. “Cedrus deodara.” Floridata Plant Encyclopedia. Accessed March 16, 2016. 6. “Deodar Cedar: Cedrus deodara.” Arch and Ann Sharer Arboretum, North Carolina Wesleyan College. Accessed March 16, 2016. 7. “Deodar cedar.” Department of Forest Resources and Environmental Conservation, Virginia Tech University. Accessed March 16, 2016. 8. 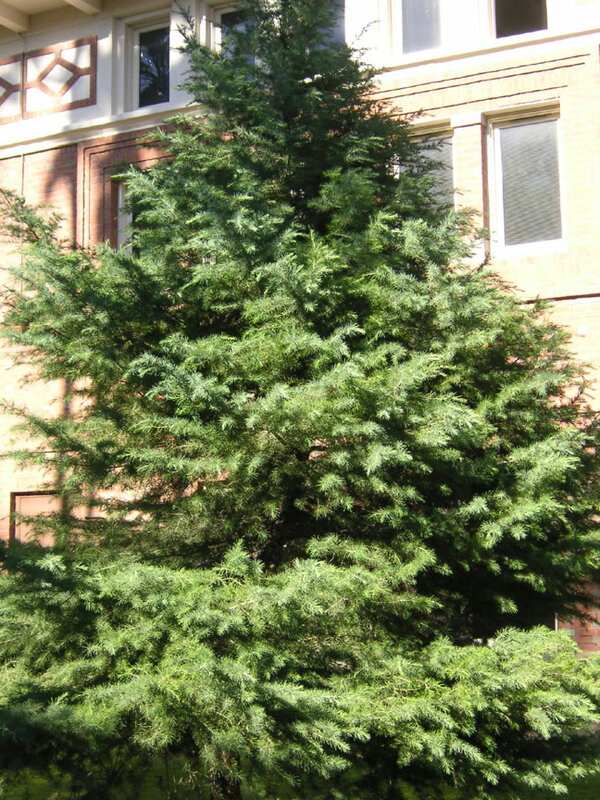 “Deodar Cedar.” Clark County Extension, Washington State University. Accessed March 16, 2016. 9. “Cedrus deodara.” Botanic Gardens, College of Agriculture & Natural Resources, University of Delaware. Accessed March 16, 2016. 10. “Cedrus deodara – (Roxb. ex D.Don.) G.Don.” Plants for a Future. Accessed March 16, 2016. 11. “Deodar Cedar.” SelecTree: Tree Detail. Urban Forest Ecosystems Institute. California Polytechnic State Univeristy, San Luis Obispo. Accessed March 16, 2016. 12. “Cedrus deodara.” www.worldagroforestry.org. Accessed March 16, 2016. 13. “Deodar cedar.” Kew Royal Botanical Gardens. Accessed March 16, 2016. 14. “Deodar Cedar.” The Woodland Park Zoo. Accessed March 16, 2016. 15. “Cedrus deodara.” www.forestrynepal.org. Accessed March 16, 2016. 16. Gilman, E. and Watson, D. “Cedrus deodara: Deodar cedar.” Environmental Horticulture Department, Florida Cooperative Extension Service, Institute of Food and Agricultural Services, University of Florida. Accessed March 16, 2016. 17. “Cedrus deodara.” IUCN Red List of Threatened Species. International Union for Conservation of Nature and Natural Resources. Accessed March 16, 2016. 18. McGowan, J. “Majestic Conifers of the Himalayas.” Los Angeles Times: Home 56, Dec. 5, 1982. 19. “Cedrus deodara.” College of Agriculture and Life Sciences, North Carolina State University. Accessed March 16, 2016. 20. “Cedrus deodara ‘Pendula’ – Weeping deodar cedar.” University of North Florida. Accessed March 16, 2016. 21. McGowan, J. “The Deodar Tree: the Himalayan ‘Tree of God.’” Blog. Accessed March 16, 2016. 22. “Cedarwood Oils.” Corporate Document Repository, Food and Agricultural Organization of the United Nations. Accessed March 16, 2016. 23. Anthwal, A., Sharma, R., and Sharma, A. “Sacred Groves: Traditional Way of Conserving Plant Diversity in Garhwal Himalaya, Uttaranchal.” Journal of American Science, 2(2), 2006. 24. “Cedarwood, Himalayan, Essential Oil: (Cedrus deodara).” BioSource Naturals. Accessed March 16, 2016. 25. Christmas Tree Lane Association. www.christmastreelane.net/. Accessed March 16, 2016.